The Hitch On Jazz Juniors International Exchange, held annually in Kraków, is not just any old competition with clear winners and losers. There were highly enjoyable concerts and at times it felt more like a festival than a competition. It is a very clear statement that mutual exchange brings short-term and long-term benefits to everyone who takes part. There are two strands: the Juniors competition for those under 25 years, and the Showcase aspect for all the rest. The juniors were competing for a cash prize and recording opportunities. The showcase bands had the chance to play in front of festival directors and get themselves some work around the world. 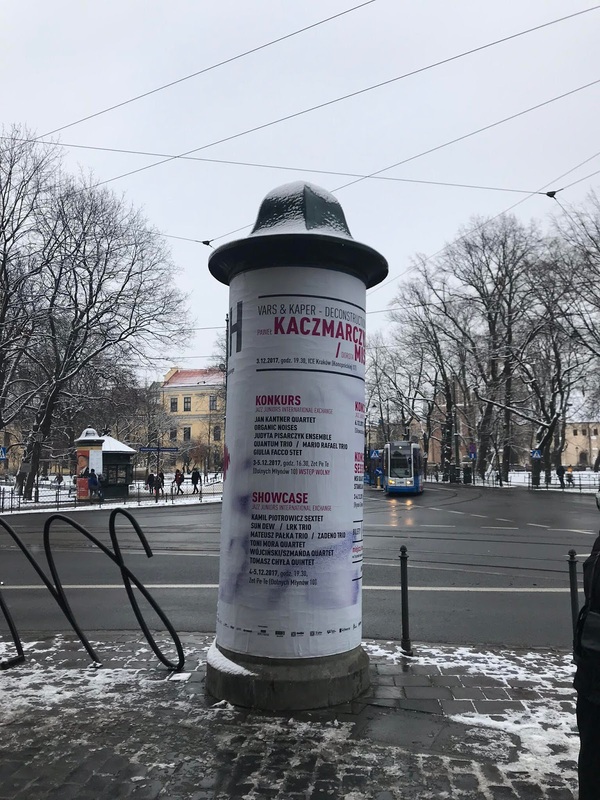 Each showcase entrant had to provide a “sponsor” – either a club, festival or record label – who would offer an opportunity to other entrants in exchange for their sponsored band taking part in Kraków. The juniors were also seen and heard by the sponsors which could lead to future partnerships for them too. So everyone benefited from the experience. Jazz Juniors has been going for over 40 years, but the showcase aspect was new. 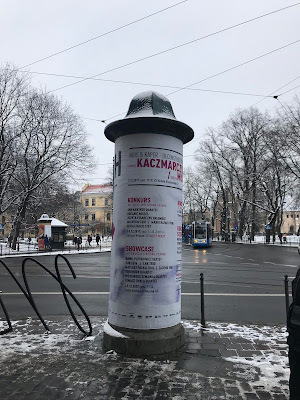 The exchange showcase idea was the brainchild of pianist Pawel Kaczmarczyk, who realised that mutual exchange could overcome the financial and other barriers to stepping onto the international stage. He has since toured China and other countries, proof that the concept works. The CEO Tomasz Handzlik said he was proud to see young Polish musicians such as Mateusz Pałka step on to the world’s stage via success in competitions such as this. The auditions and showcases took place in a very interesting part of Kraków, Dolnych Młynów, just 10 minutes walk from the main square, where disused factories have been transformed into a vibrant hub of dance schools, craft beer bars, vegan restaurants and nightclubs, including Zet Pe Te where the music happened. Over three days six predominantly Polish bands performed auditions in front of a Jury for the Juniors. And eight bands from Belgium, Germany, Italy, Russia and Poland showcased to a Programme Board comprising Festival and Club Directors from Serbia, Spain, China, Russia, Croatia, Italy, Poland, Slovakia and Hungary. Bands were pre-selected by a Qualification Commission which included Dave Douglas and Lars Danielsson who had the task of listening to the submissions of the 78 entrants and creating the audition list. It was striking that we heard only one standard in 14 concerts. At a Gala concert in Radio Kraków on 6 December 2017, the winners were announced. It was probably no surprise to those of us present at the auditions that First Prize went to Quantum Trio from Poland-Chile. The band comprises Michal Jan Ciesielski (saxophones), Kamil Zawislak (piano) and Luis Mora Matus (drums), where a rhythm section of drums and piano more than compensated for the lack of bass. In addition to a cash prize they won the opportunity to release a CD on the Italian label Emme Records and several invitations to international festivals. They were impressive from the moment they walked onto the stage. Their enthralling short set of catchy physics-inspired titles was unashamedly full-on and gutsy, with memorable hooks tightly held together. Think early Roller Trio with an Eastern inflection. Special mention must be made of the winners of the Second Prize, Vibe Quartet. They had a nervous start, possibly there was a fault in the monitors, and for a few anxious moments their set seemed to fall apart. But then the vibes player Michal Puchowski seized the moment, calmed the nerves and nailed it with a captain’s innings. Alongside the competition there were concerts in the cosy Harris Piano Jazz Bar. I caught the album launch of violinist Mateusz Smoczyński’s solo album, Metamorphoses. Smoczyński won the Second Zbigniew Seifert Jazz Violin Competition in 2016 and this album release by the Zbigniew Seifert Foundation is further proof that lasting relationships are one of the main outcomes of Polish competitions. It was an emotional set of own compositions where Smoczyński overlaid chunky danceable pizzicato and ghostly reverb with heart-stopping improvisation. This wasn’t about technique, this was music straight from the soul and it was warmly received on a very cold night. Next year the competition will be renamed as the Hitch On Music Exchange with many more entrants and partners.